Spiritual Coaching and Character Building is a series of activities organized by Biro Mentoring of Forstilling FEB UB. Among its activities are Launching Event Mentoring held on March 10th 2018, Road To SCCB on 15th – 16th May 2018, and its peak activity is when PKK MABA in August – November 2018. The activities are held in FEB UB’s area and involving all S1 students of FEB UB who wish to join the agenda. 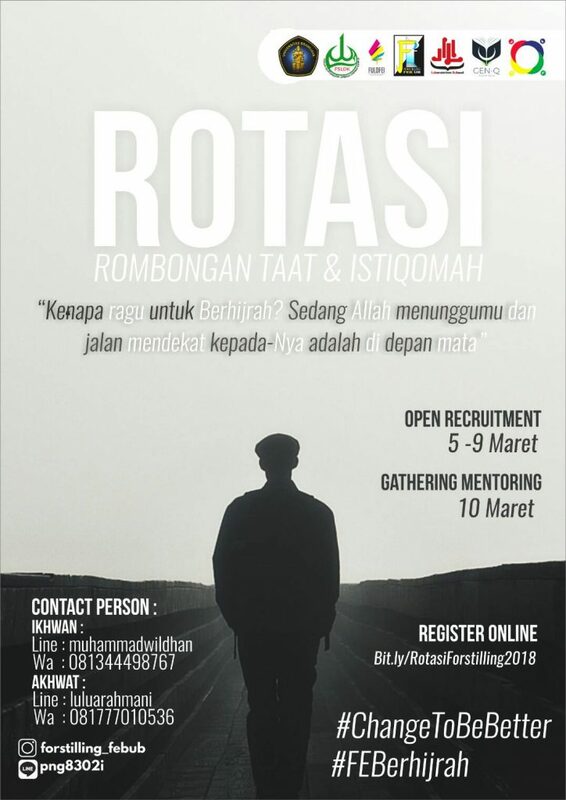 The purpose of the holding of the event is as a forum for all students of the Faculty of Economics and Business Brawijaya University especially for Forstilling members to know and understand about the urgency of mentoring and how to convey goodness and receive goodness properly and correctly in a Faculty of Dakwah Institution and to prepare to become a mentor in the future. In the first series of activities, the Launching Event Mentoring held on March 10, 2018 is housed in Hall of D’s Building in 3rd Floor, and the event will begin with registration of participants. Then opening with a welcoming by the Chairman of Forstilling and the Chief Executive of the Event. Then proceed with the giving of material and motivation about Mentoring Fun followed by Ice Breaking then Ishoma and continued with second matter that is about Mentoring As Form of Ruhiyah Safeguard which ended with closing session. The second series of activities, namely Road To SCCB held on May 15th – 16th 2018 and held in Hall of D’s Building in 3rd Floor. The activity of half a day but runs two days in a row is a workshop on Public Speaking which on the second day held Simulation of Mentoring for genuine preparation in welcoming SCCB at PKK MABA. The peak activity of this series of activities is SCCB which will be implemented at PKK MABA that is from August to November 2018. This activity is giving material from the mentors to the new students of Muslim FEB UB with the composition of 10-15 students or students in it which is held by one mentor. The time given is one and a half hour to deliver material to new students and students in the form of small circles located in the area of ​​FEB UB.